Haskap berry is becoming more and more popular throughout the Northern Hemisphere, mainly because some of its varieties bear fruit already in mid-May, so we can enjoy them even 2 weeks before strawberries. The great asset is also the longevity of this plant, as well as high resistance to frost and disease. Haskap berry has several varieties that are grown in various countries around the world. Each variety differs from each other in the shape and taste of the fruit, as well as the size of the bush. There are Canadian varieties growing on our plantation – Aurora, Indigo Gem and Honeybee as well as Polish – Wojtek and Jolanta. Also noteworthy are Russian varieties Bakcharskaja Jubilejnaja, Bakczarskij Velikan, Docz ‘Velikana or Streżewczanka. The Canadian and Polish varieties ripen in the second half of June, while the Russian ones in mid-July. average yield from the bush: 5 kg. average yield from the bush: 4 kg. 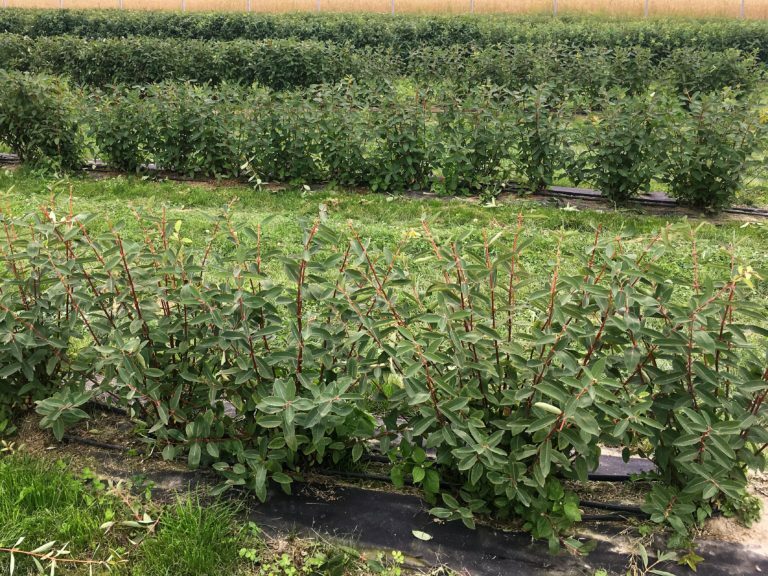 Haskap berry has very little soil and climatic requirements, however, before planting it is necessary to verify if our field meets the optimal conditions for growing these shrubs. The plant is long-lived, so the better we prepare the position, the longer we will enjoy fruits. Haskap berry is not demanding in relation to the soil. It grows well in almost every soil, except for wet (heavy, loamy) and dry (light, sandy). On dry and permeable soil it requires irrigation, especially in the first and second year after planting – so that the shrubs can produce a profuse and deep root system. 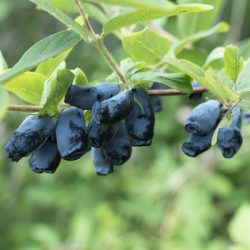 Haskap berry plants are tolerant to the pH of the substrate, they can successfully grow in the pH range 5-8 (the optimum is slightly acidic: pH 5.5-6.5). Avoid locations where cold air, humidity or near ground water are collected. Long-lasting spring floods also adversely affect them. They are plants that tolerate large air pollution. 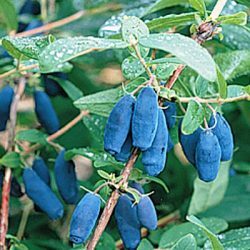 It is a light-loving plant, it tolerates light shading, but then the berries are smaller. To get a generous harvest, haskap berry should be grown in a sunny and sheltered from the wind position. The shrubs are completely resistant to frost, they tolerate temperatures down to -45°C, flowers tolerate up to -8°C. In the spring, leaves often develop when there is still snow. Young, green shoots can withstand a temperature falling to -16°C. Prefers moist positions. Observations showed a negative effect of drought in the period of fruit formation and maturation on their quality, tendency to fruit fall, reduced yield, and even increased susceptibility to diseases (including burns). Watering the plantation causes a significant increase in the weight of berries and prevents them from prematurely sinking. The air moisture saturation around the bushes is also beneficial, which can be achieved by irrigating the bedding under the shrubs. As you can see, haskap berry has very little soil and climatic requirements, however, before planting, it should be verified that our field meets the optimal conditions for growing berries. The plant is long-lived, so the better we prepare the position, the longer we will enjoy fruits. At first, the berry does not grow very quickly, but already in the second year after planting, we can collect the first fruits, and in the sixth year the plant reaches full fruiting. Bushes for the first few years do not require pruning, only damaged shoots are removed. Nursing undercutting begins only after 6 years. On a regular basis, however, we must eliminate weeds, because haskap berry does not tolerate the company of all kinds of weeds. It is also worth enriching the soil with natural fertilizers, eg compost or manure. Fertilization is best done twice a year, spring (early April) and summer (early July, after harvest). Shrubs should be planted at appropriate distances (2.5 x 0.7 m for smaller crops, 4-4.5 x 0.7 m for larger crops, with later use of the combine harvester). You must also remember about the pollination of the plant, so you should plant at least 2 varieties of berries.